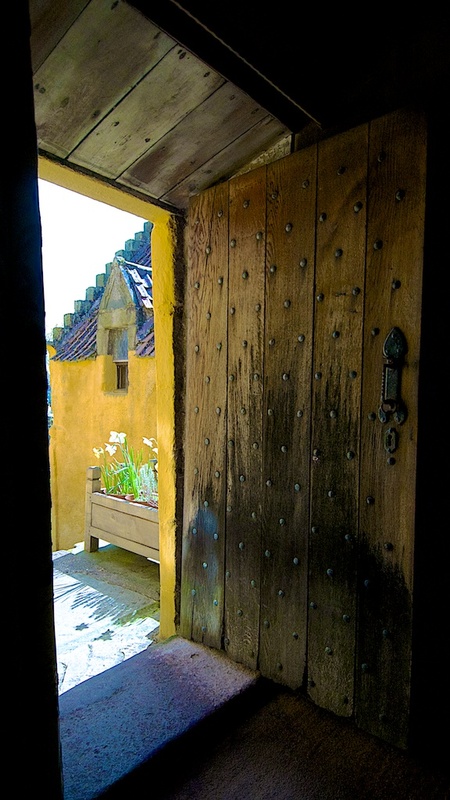 The first thing that strikes you about Culross Palace is its colour. 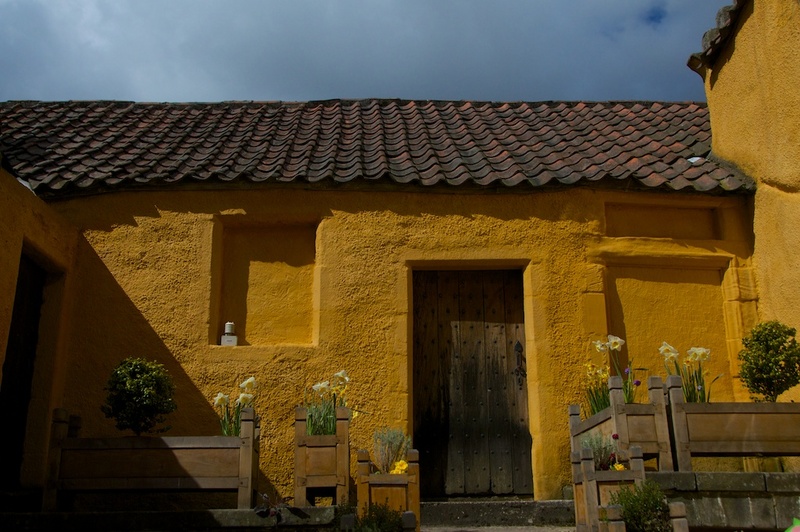 Rich mustard yellow walls beneath an orange pantiled roof glow with warmth even on overcast days, making you wonder if you’ve have strayed down to the Mediterranean instead of crossing the Forth Bridge into Fife. In the late 16th century, this covering of ‘king’s gold’ – limewash mixed with yellow ochre – would have spoken clearly of status and wealth. A coal mine in the sea doesn’t sound like an easy place to work, but apparently the ventilation was much better than in land-based mines of that period, and its location made it easy for ships to tie up alongside for loading. The result was so successful that the Moat Pit was visited by James VI, and it certainly made Bruce’s fortune. 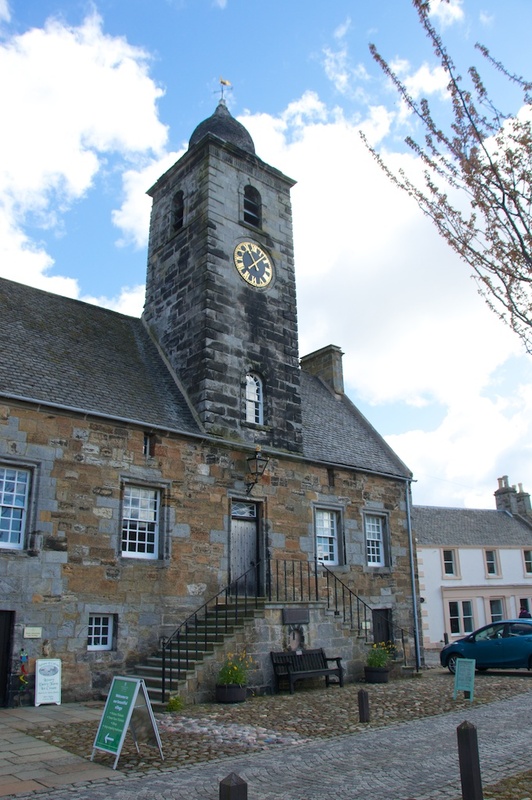 It also transformed the coastal district, strengthening trade with the ‘Low Countries‘ (now the Netherlands and Belgium); this also explains the abundance of Dutch-style pantiles and crow-stepped gables in the East Neuk of Fife. Sir George Bruce of Carnock (c.1550-1625) was the third son of Edward Bruce of Blairhall, who was in turn descended from Robert the Bruce, through the Bruces of Clackmannan. He married Margaret Primrose, and they had three sons and five daughters. 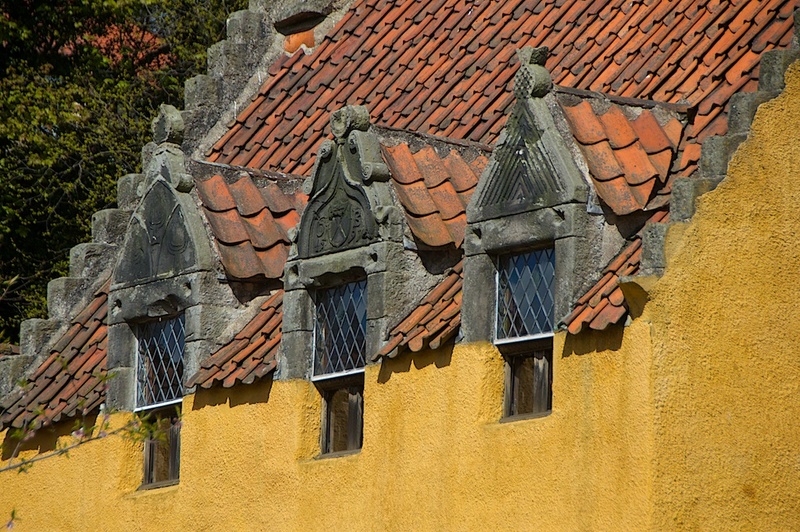 Unusually, the term ‘Palace’ when applied to Culross doesn’t indicate a royal residence, but is a measure of the wealth and influence of its owner. There were other sources of income, too: in the late 16th century, Culross produced more salt than anywhere else in Scotland, and the coal mined by Bruce was used to heat the salt pans for evaporation. It was a beautiful spring morning when we visited Culross, and the blossom on the fruit trees was unfolding in the first warm sunshine that we had felt this year. As picturesque as Culross Palace is, it’s still difficult to walk straight up to it, purely because of the distracting charm of Culross itself: with its cobbled streets and quaint fairytale houses, this little place is still asleep in the 16th century, and you feel as if driving a car through its quiet backwaters might break the spell. Since I was doing a bit of writing for the National Trust for Scotland, who are the caretakers of Culross Palace and most of the village, Colin and I were lucky enough to be given a guided tour of the buildings by members of the NTS team. We stepped first into the laird’s room in the west wing. These were the private apartments of George Bruce, and they still impress you with their dark panelling and heavy oak furniture. Leading off from here are several chambers including a withdrawing room, the Principal Stranger’s Bedroom – a fabulous name for a guest room if I ever heard one – and a fireproof strongroom for the storage of important documents. I don’t think I’ve ever been anywhere that has so much beautiful painting preserved on its oak-panelled walls, and the first taste of this was in the bedroom, where the setting and rising sun, each on opposing walls, would have met the eyes of guests as they either drifted into sleep or woke in the morning. From there, we wandered into the central part of the Palace, enthralled by the splendour of the Painted Chamber and enchanted by the period relics that have been collected to enrich the experience. Sunlight streams through latticed windows, onto oak floors and sumptuous four-poster beds, highlighting the reds and golds on walls and ceilings. It’s a welcoming place, quietly dignified rather than outspoken and brash. No photography is allowed inside Culross Palace, and I can only recommend that you come and experience this wonderful jewel of a place for yourself. It was rescued for the nation, along with many other houses in Culross, by the National Trust for Scotland, having fallen into disrepair by the early 20th century. To me, the restoration seems sympathetic without being over the top: you only have to look at the old photos on the RCAHMS website to see what a poor state it was in before the remedial work took place. At the back of the Palace, on a slope that faces south and catches the afternoon sun, is a beautiful garden that has been restored in the 16th century tradition. Paths of crushed cockle shells lead you ever upwards, past beds of herbs, vegetables, fruit and traditional flowers, with an old ‘doocot’ and plenty of seats for admiring the view across the Firth of Forth. In one corner, a flock of Scots Dumpy hens were scratching around happily. 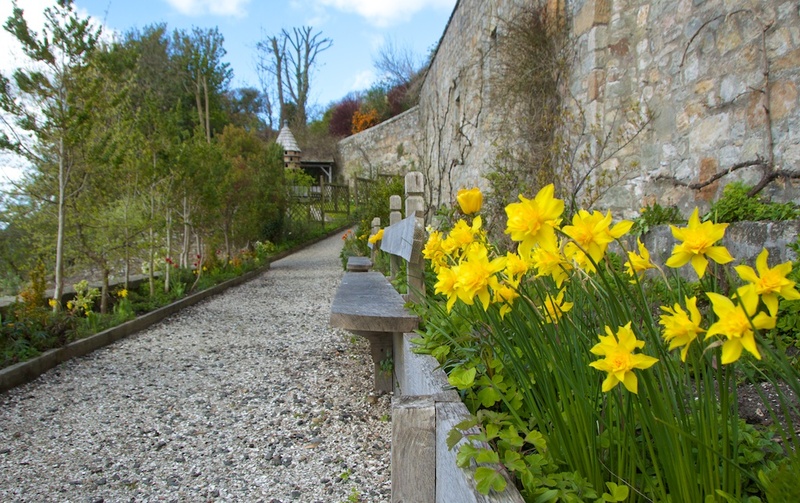 It’s a tranquil haven, obviously tended with care and an awareness of the heritage – even down to the choice of plant species. You can go on guided walks around the town, fascinating if you’re interested in the old architectural details that have been preserved, or if you want to glimpse some of the stories that are lurking in the shadowy corners. The NTS visitor centre is in the old Townhouse, an imposing structure dating from 1626, with a tollbooth, a gaol, and a witches’ prison up in the roof. Our guide, Linda, gave us a glimpse in here, and the feeling was intense: I can safely say I have never been so glad to get out of a place in my life. 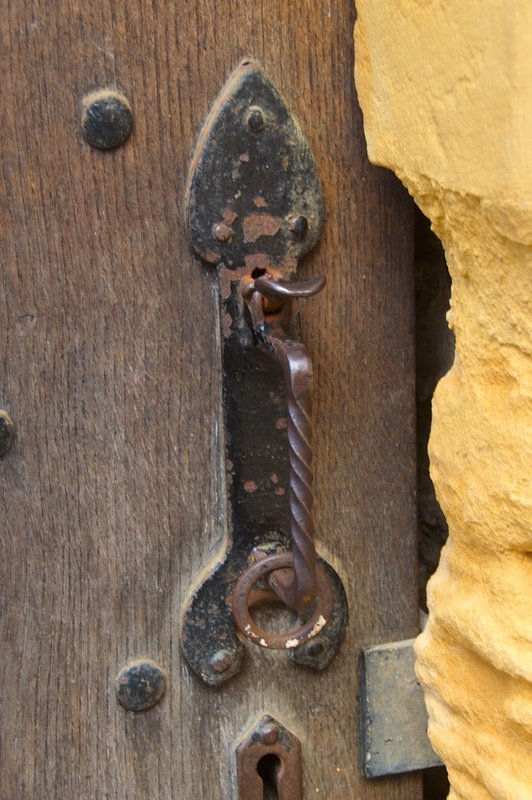 On the front door of some of the houses is an interesting detail known as a tirling pin, a twisted iron handle with a ring dangling loosely on it. Callers would flick the ring so that it spun around the handle from top to bottom, making an eerie noise that would certainly attract the resident’s attention! Parts of the fabulously popular ‘Outlander‘ series, produced by Starz and based on the books by Diana Gabaldon, were filmed at Culross. 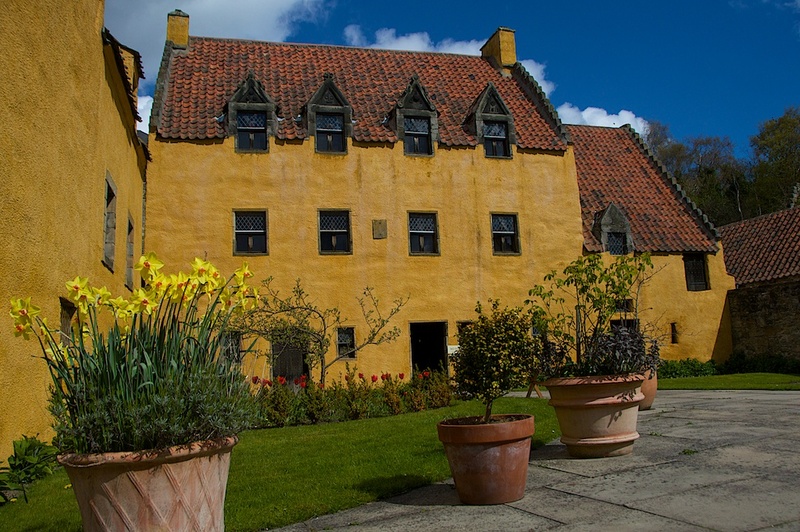 The town served as the fictional village of Cranesmuir, and Culross Palace itself provided the setting for many scenes: the withdrawing room was Geillis Duncan’s parlour in Season 1, while the laird’s room was a Jacobite meeting room in Season 2. 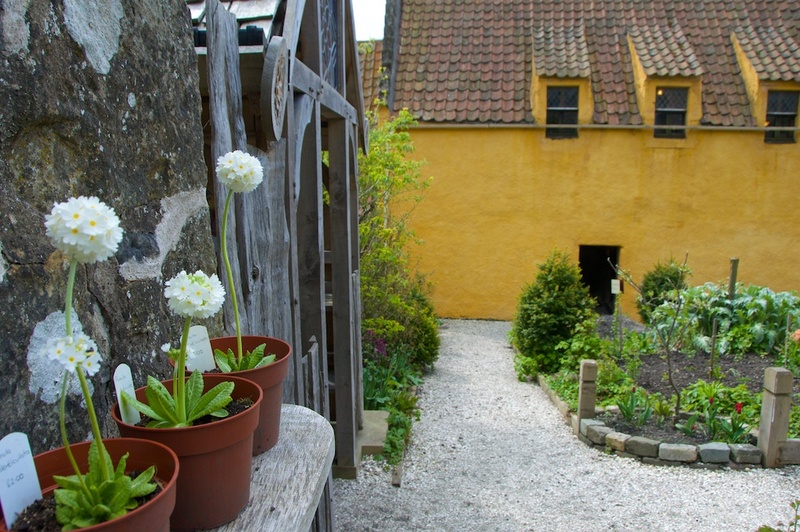 Outside, the beautiful kitchen garden to the rear of the Palace was used as a setting for the herb garden at Castle Leoch. Elsewhere in Culross, there were dramatic scenes filmed from the small high room in a tall building known as The Study, looking down onto the mercat cross in the cobbled square where a boy had his ear nailed to the stocks and was rescued by the story’s main characters, Jamie and Claire. As for Sir George Bruce, his beloved Moat Pit was severely damaged by a storm on 30th March 1625. It proved impossible to drain, and Bruce died only five weeks later. 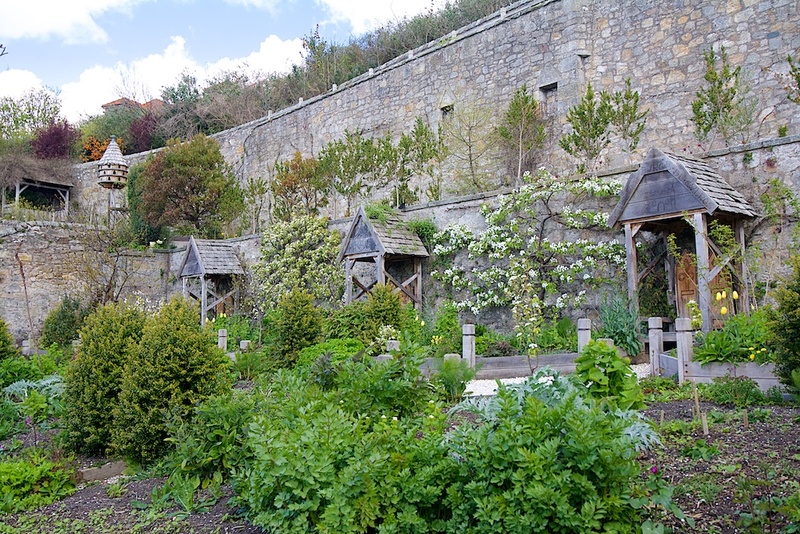 He must have been heartbroken – but after all, he brought wealth and trade to the coast of Fife, and he would surely be glad to know the pleasure which his lovingly created home is now bringing to thousands of visitors from all over the world. Visiting Culross Palace: Culross lies between Dunfermline and Kincardine on the north shore of the Firth of Forth, about 20 miles from Edinburgh. 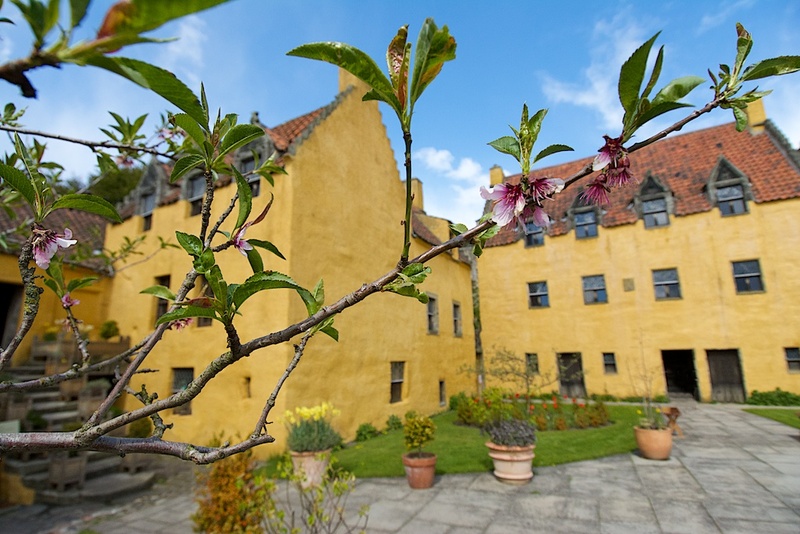 You’ll find opening times and admission prices for Culross Palace on the National Trust for Scotland’s website, along with details of guided walks around the town. If you’re coming by car, it’s best to park in one of the car parks on the outskirts and walk in – it’s not far, and you’ll see why when you get there! 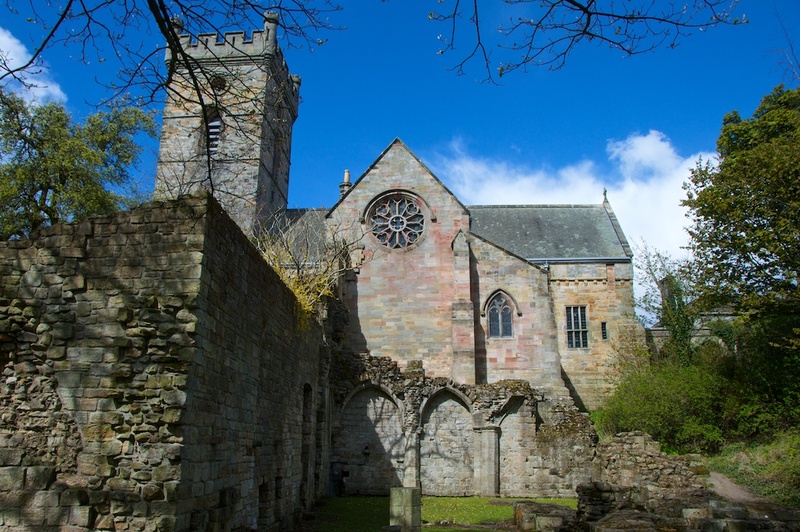 George Bruce was by no means the first to mine coal in Culross: that honour goes to the monks at Culross Abbey, which stands on a hillside above the village. I’ll be telling you more soon! When I heard this place was on my tour in 2014, the thought of it didn’t really interest me. But I was wrong. This place is just like stepping back into the early 17th century, so well preserved and beautiful. Thanks for bringing back the memories Jo! Glad to do so, Susan! Likewise, I can’t believe it took me nearly 6 years to visit Culross. It’s less of a historical site, more a complete historical experience! Thanks, Jo, really interesting! I’d never heard of an underwater coal mine before. The pictures from before the restoration do show some of the beauty of the place. Wish I could just hop over there and see it now. 🙂 Maybe someday. What an interesting post Jo. I must visit Culross sometime. Your photos of the garden are magnificent. Thank you, David! 🙂 I was so pleased that we went to see Culross for ourselves. You’d love it! I can recommend the cafe as well, just off the square. Hi Jean and Terry, lovely to hear from you! 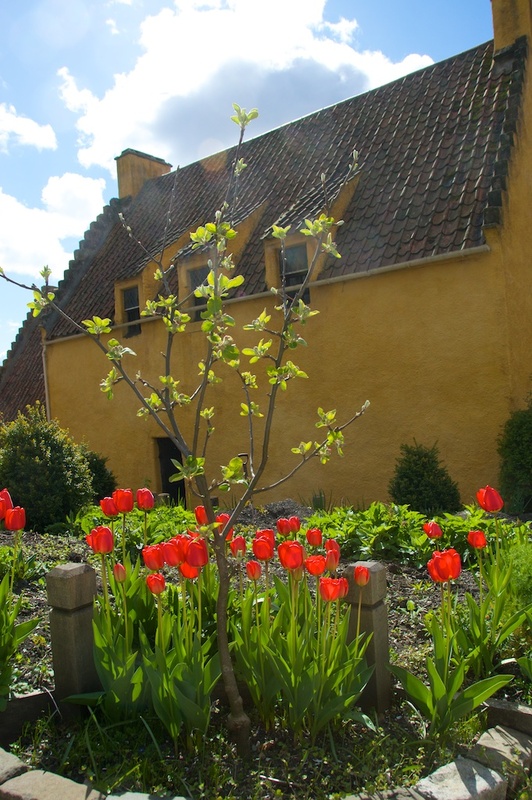 Yes, you’d love Culross so much – a good reason to come back! What a gorgeous place to visit. And your photographs and wordsare superb as usual. Thank you very much, Lynne, that’s very kind! The ‘East Neuk’ is a place we don’t explore much but it’s very pretty, and Culross is in a league of its own. Reblogged this on Christy Jackson Nicholas, Author and Artist. Beautiful photos, Jo- I never expected to see such warm Mediterranean colours in Scotland! Yet another place to add to my list of places to go. Thank you! Culross was on my list for a while, but I really was blown away by this fantastic place. Take a tour if you can, it’s worth it! Interesting place with so many flowers. The colours are very nice. We had fun photographing the colours! Lucky with the tulips and daffodils out in the garden, which made a lovely show against the walls. Beautiful photos, Jo. I didn’t know you could go inside the Old Townhouse and I’ve never been on a guided tour of the village, but I can imagine it would be really interesting to do. How curious about that door handle, quite a change from the ‘ding dong’ we’re used to these days. 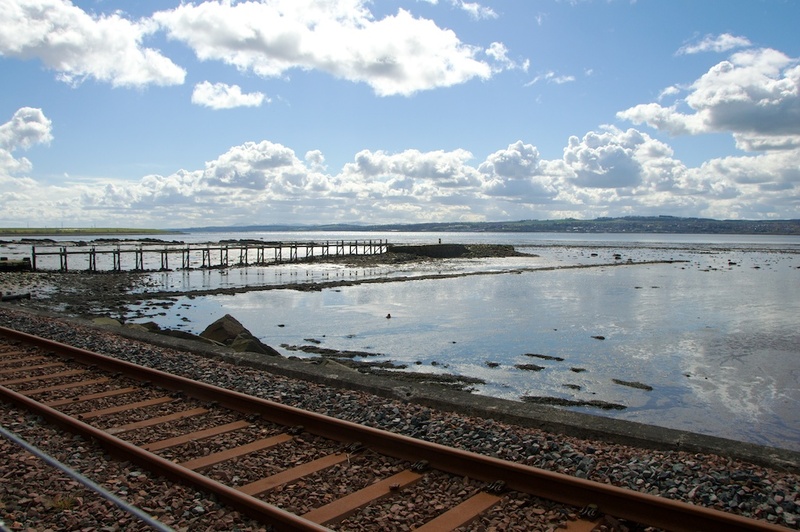 Culross has been on the ‘must visit’ list for awhile, but we’ve not made it yet. So it was particularly interesting to get your excellent insight and see your shots. The term ‘Principal Stranger’s Bedroom’ will be officially adopted shortly, though it may puzzle the kids a bit. Is there a good reason for the photography ban? 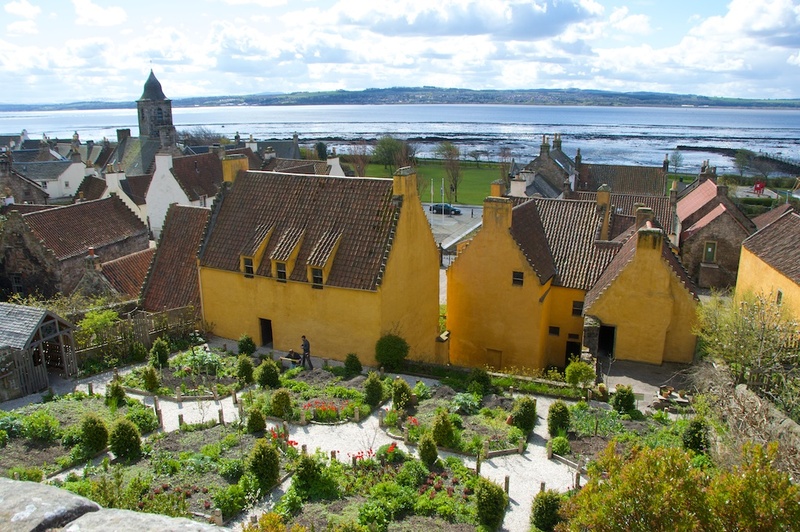 I’m sure you’ll enjoy Culross – it’s as if the 16th century kind of engulfs you, as you walk around the village! I think the NTS has a policy of no internal photos in all its properties – probably to do with the security of furnishings and artefacts, if the photos were published online.